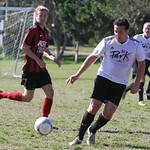 A depleted Rams premier squad took the field against a youthful and determined Alstonville side on Saturday, July 27 at the Byron Rec Grounds. In the Reserve Grade match, the Rams took on the high flying Alstonville team who beat them six goals to one in the first round. It was a vastly different encounter this time round however and Alstonville had their wings clipped by a slick Rams outfit. The Rams, with the support of Will Innes from the Byron Firsts and young Nick from the sixteens outplayed the Alstonville side in all facets of the game. Byron went one nil up half way through the first half when evergreen Steve Kirkpatrick converted a penalty. 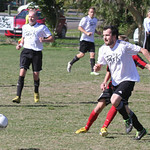 Outstanding defence by Yantra Whitling and 'Keeper Lachlan Baines repelled every Alstonville counter-attack. A controversial penalty awarded to Alstonville was converted and the score was deadlocked at one all. Mark Greenslade, Nathan Burvill and Farren Lathem-O'Brien took control and we were all over the Alstonville side. When Steve Kirkpatrick stepped up to take a free kick thirty years from goal there was a sense of something special happening. Steve's rocket like shot hit the net before the Alstonville goalkeeper could move. The Final 2-1 scoreline was a great win to the Rams. With several key of players out through injury or circumstance the top-squad clash was always going to be a tough battle for the Rams. It was obvious that it wasn't going to be their day from the starting whistle as Alstonville scored after thirty seconds. When a second goal sneaked into the Byron net, the Rams were stung into action. 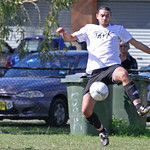 They took control of the match and, with Lachlan Dewar calling the shots in midfield, began to go forward. Chances were created with both Layton Barton and Sequoya Rawson-Smith close to scoring. Sam Owens caused the Alstonville defence some concerns with his relentless flanking breaks. Finally Layton Barton headed a fine goal after Sequoya rose high to head a ball across the goal mouth. At 2-1 going into the break, Byron were in command. The Rams attack continued into the second half and it seemed only a matter of time before the equaliser. An innocuous long ball, however, found the Alstonville striker and suddenly it was three one. Once again the Rams struck back with a magnificent diving header from Herrick Schuenemann. Three two and Byron were still in the game. Layton Barton was carried from the filed with a knee injury injuries to James Packham and Herrick Schuenemann took their toll and a red card for Lachlan Dewar saw Byron's chances of a comeback slipping away. A final goal to Villa sealed the match. Next week the Rams play Bangalow at Bangalow in a local derby on Friday night at 6pm and 8pm. It will be all hands on deck for a Byron squad sorely depleted by injuries and suspensions.